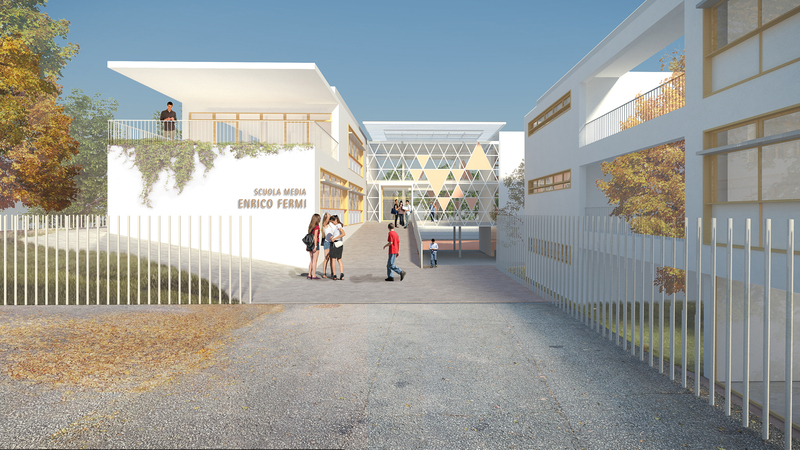 The project for the upgrading of the Enrico Fermi school aims to maintain a language and an architectural identity recognizable by intervening in substantial way only in the central part oft he building. A new and welcoming focal point of the school, overcoming the current introversion with a more transparent structure. At ground level is concentrated the public area of the school that lives in continuous relationship between interior and exterior through a continuous system of open spaces that allow a sense of circularity and inclusion. At higher levels, accesses are differentiated distinguishing incoming streams and clusters developed around new transparent, versatile and flexible spaces. The pedagogical concepts to which the project refers allow the most effective processes of learning: considering students as active subject of educational activities.